With the decision by the Kansas State Board of Education to adopt the Common Core State Standards, there are now 38 states participating in this cooperative effort to standardize high expectations for all students in the United States. Assessment Technology, Inc. is responding to this coordinated effort by the states to establish clear, common guidelines as we work to develop the next generation of instructional and assessment technology. Users of Galileo K-12 services are already familiar with the alignment of our instructional materials and assessments to the specific state standards that have been in use. Now, as we transition into the Common Core State Standards, we are drawing upon the resources from each state that helped inform the development of the Common Core State Standards while also expanding and innovating to address the greater breadth and specificity in the new standards. To provide an example, in third grade language arts, states where Galileo K-12 is used had as few as 16 and as many as 68 standards, sometimes incorporating writing as part of the standards, and in other states having separate standards for writing. In the Common Core State Standards, third grade English/Language Arts has 92 standards for instruction and assessment. We all know that third-graders aren't being expected to learn an additional 50% more than their predecessors. The Common Core State Standards are instead providing a greater degree of specificity in identifying the skills and knowledge that a student in the third grade is supposed to master to match the progress expected of all third graders in the Common Core State Standards. Each state adopting the Common Core State Standards will develop crosswalk materials that align its existing high-stakes assessment items and prior standards to the new standards. ATI is already engaged in that process, drawing from our nationwide experience to incorporate the proven materials in our item and activity banks in specific alignment to the Common Core State Standards expectations. 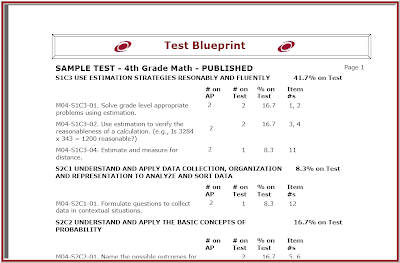 These items and activities will then be available to teachers to use in identifying initial student performance on the new standards and then evaluating student needs for instruction on standards that may be different or more detailed than was present in the previous version of state standards. This is where our extensive content from multiple states will prove valuable, having a ready resource for assessment and instruction in these newly emphasized capabilities. We are looking forward to working with all of our client districts as this new era of educational cooperation and heightened expectations of student success unfolds. By now, it should come as no surprise that the recent proliferation of new educational policies and funding at federal and state levels is designed to facilitate a new era of reform in America. The overall effort to channel American education in new and innovative directions has presented an array of challenges and opportunities at all levels of the education continuum. Yet, when all is said and done, it is within the local community and school district where the broad sweeping ideas of educational reform are carefully vetted in the context of local reality. It is here where the local school board, administrators, educators, students, families, volunteers, and community partners systematically work together to develop plans for implementing reform. It is axiomatic that within this local context, success in implementing and sustaining reform efforts over the long-term is best achieved when districts and governing boards exercise local control across a broad range of decision-making activities. Among the most salient of these decision-making activities is the selection and adoption of technology-based instructional improvement systems that provide a “best fit” with the district’s educational reform and student achievement goals. An instructional improvement system is generally conceived of as a technology-based, data-driven, standards-aligned, integrated system comprised of assessment, reporting, and instructional tools that can be used to support district efforts to elevate student achievement. • How will input from stakeholders be gathered and taken into consideration? • How will stakeholders be informed of the instructional improvement system options available? • Will there be a formal review committee or will administrators seek stakeholder input? • What are the overall goals of our district in using an instructional improvement system? • What are our assessment and reporting goals? • What are our goals for the students? • What are our goals related to providing educational content and monitoring curriculum implementation? Criteria to be considered in evaluating the “best fit” between an instructional improvement system and district goals might include taking a close look at the system’s assessment, scoring and reporting, and instructional capabilities. Consideration should also be given to the extent to which the system can accommodate professional learning communities and provide flexibility both in system implementation options and adaptability to changes in standards and government requirements. Finally, the security measures, data management features, and technical requirements of the system should be thoroughly vetted. • Will the selection process require a request for proposal (RFP) and if so, how much time is needed to review RFP responses and move the process through district channels? • If an RFP is not required, what selection process will be used, who is involved, and how much time is needed? • How will our governing board be included in the process and how will their role impact the timeline? • What post-selection tasks and customization (district pacing calendar aligned benchmarks) might impact the timeline? • Gather information and materials including background research and referrals. • Interview each organization offering an instructional improvement system solution and request an online walkthrough. This will allow you to preview systems and create a short list for presentations at the district. • Request on-site presentations so that you can see firsthand the extent to which the various options meet your district’s needs. • Ask for access to the system and assign staff to “try out” the system. • Carefully review written proposals and cost estimates against your criteria and talk to other districts that use the instructional improvement system under consideration. While adaptive testing has been around for a long time, it has recently been gaining in popularity. Many have been looking at it as a magic bullet to meet the data driven decision making requirements of the modern accountability era. The approach can greatly shorten the time required to deliver an assessment with an acceptable level of measurement precision. While it is certainly true that adaptive testing has a number of potential benefits that provide it a place in the assessment bag of tools, it also has a number of limiting characteristics that have to be considered in selecting it for a particular use. How does an adaptive test adapt? The approaches that are currently used fall into two basic categories based on whether adaptation decisions are made after every item or after a group of items. In the first case, a cumulative score is calculated each time a student completes an item. The next item is typically selected by determining the item that will provide the optimal level of information regarding the student’s ability. Once a score has been reached that provides an adequate level of measurement precision, the assessment is ended. Typically this endpoint is reached after far fewer questions than would be required to achieve a comparable level of precision on a standard or “linear” test , thus making the approach extremely efficient. In the second case, decisions are made after administering preconfigured blocks of items rather than on an item by item basis. A typical design might specify a routing test followed by two stages, each of which involves a decision between pre-constructed item blocks optimized for lower, average, and high ability. In this design, students would complete the routing test and then be assigned to the appropriate second stage item block based on their score. After completing the second stage they would again be routed to the appropriate block of items in stage three based on their cumulative score on the routing test and the second stage. After completing the third stage the assessment would be ended and an overall score determined based on all the items completed. What are the benefits of adaptive testing? One of the most notable is its efficiency. This is particularly true with the item by item approach. As I mentioned, an adequately precise measure of a student’s ability may typically be achieved with far fewer items than would be required for a typical “linear” test. This efficiency can make the approach far easier to use when large groups of students must be tested in a short time. What considerations go along with the benefits? Two of the most fundamental are content control and item exposure. Both are controlled to some degree by the multi-stage design. The multi-stage design is not quite as efficient as the single-stage design. However, in those cases in which content control and/or item exposure are important considerations, the multi-stage approach may be preferred. Content control is especially important in standards-based education. While the item by item approach is extremely efficient, the ability to ensure that all students are exposed to content reflecting standards targeted for instruction may be compromised in the item by item approach. Johnny, Suzy, and Javier may all sit down together and not be exposed to any of the same items. Suzy may have to multiply fractions while Johnny and Javier don’t. This may not be cause for concern if the test is being used for purposes of screening, but it may limit the utility of the measure if the results are being used for very specific decisions about student instructional needs. For instance, if there are instructional decisions to be made about providing instructional coaching on multiplication of fractions for Johnny and Javier, it would likely be most informative they had actually been asked to respond to the questions that Suzy was given. While Item Response Theory (IRT) may be used to estimate the probability that students have mastered these skills even if they haven’t been given the questions, actual administration of the items can afford the additional benefit allowing mistakes to be analyzed. The pre-constructed design of the multi-stage approach affords control of this issue at the expense of some efficiency. Item exposure is particularly important when item security is a concern. The focus of the item selection algorithms on picking the optimal item for a given ability level can mean that the same limited set of items come to the top of the heap repeatedly. This is particularly true for the item by item approach. This issue can limit the utility of the assessment for repeated use because students are likely to see the same items again and again. In high stakes situations, the door is open for cheating because the items that are likely to show up become predictable. As with the content consideration, the multi-stage approach provides some control over this issue at the expense of efficiency. The combination of strengths and unique considerations involved with adaptive testing point to some particular uses for which it would be a strong choice. One of the most notable is screening. The efficiency with which an adaptive test can provide a reliable measure of ability make it a good choice when the issue at hand is deciding whether a student should enter into a particular instructional group or class. The degree of content control provided by a multi-stage approach could provide more granular information when the decision at hand is whether a child should be given additional help on a specific skill or set of skills. ATI is current working on a module to support adaptive testing. The module will support the the item by item and multi-stage approaches. Provision of these options will allow districts to take advantage of the strengths provided by adaptive testing when they are designing an assessment program that will best meet their needs. ATI welcomes suggestions for new items. Such suggestions help to ensure that assessments will meet district needs. ATI currently has one of the largest item banks in the nation containing over seventy-thousand certified items. Moreover, as mentioned above, the banks are continuously growing. ATI has stringent guidelines for creating items. When making suggestions for new items, there are a number of considerations that a district may find useful. Suggestions for new items are likely to benefit the district most when they focus on the measurement of a specific skill or capability. If the district curriculum includes a particular capability that is not currently well represented in ATI item banks, suggesting the inclusion of additional items assessing the skill in question will be beneficial as long as the skill suggested aligns to the standard. At times, textbooks contain concepts which do not align to any state standards. In order to maintain the validity of ATI assessments, only items which align to a specific state standard may be added to ATI’s assessment bank. The more specific a request provided by a district, the more likely that ATI’s writers will be able to produce the exact items a district desires. Suggesting stylistic changes is generally less useful. ATI does develop items specifically aligned to the various styles of statewide assessments. ATI, as well as states testing companies, have specific guidelines for measuring reading level. Many items use specific wording in order to maintain appropriate grade-level readability. For example, the phrase “past tense” will not be used on a third grade test since the word “tense” has a reading level ranking of sixth grade. It is important to ensure that items on local benchmark and formative assessments not be limited to a particular style. Only practicing items using specific wording when learning a new concept may cause challenges for students later. Even state released items change their wordings from year to year. One year the first grade word problem may include the phrase “in all” and the following year it may include the phrase “altogether”. It is important for students to practice items using both phrases. In addition, as items become closer in style to a statewide test, the danger that test outcomes will be contaminated by the phenomenon of “teaching to the test” increases. Benchmark and formative assessments are intended to measure the mastery of standards, not merely the ability to respond to items written in one particular style. Galileo users now have the option of adding attachments to a student’s record. These attachments can be accessed through the K-12 Student/Parent Center. Districts quite often mail out announcements or test results to the student and/or family. In certain states, the local department of education has turned over the responsibility of mailing out state test results to the school districts. In these budget conscious times, Galileo can save districts money on postage as well as labor, by mailing out announcements or test results. On the Student Demographics page, there’s a link to “Add Student Files…” In addition, there’s an indicator as to how many files are attached so users don’t have to open the interface to find out. When you click the "Add Student Files..." link, the Student Files page opens. There's no limitation as to the file type that can be added, and, currently, no size limit. The option is given to add a file description. The final step is attaching the file and selecting the “Add” button. The attachments/files are viewed in the K-12 Student/Parent Center. 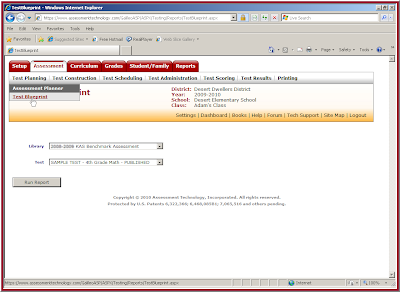 Once the student/parent logs in with the unique student user account, select the “more options” label/“Student Files” link to view the attachments. If the view/binocular is selected, the file attachment will open. With the arrival of summer ATI staff members responsible for Galileo student data management shift their focus to, of all things, fall. This focus is primarily on new classes, rosters, and accommodating all staff changes a district may undertake throughout the summer. Districts provide an export from their Student Information System (SIS) that lists all classes, teachers, and students within the district. ATI staff import this data to a test database and perform a thorough quality assurance review – any problems are resolved with the district before the data is imported (step 3) into the live Galileo database. ATI staff import the district-provided information directly into Galileo K-12 Online. Providing ‘shell’ data with class structures and teachers as soon as they are entered into your SIS this summer will provide opportunity to perform thorough review of class alignment, course codes and teacher assignments. This will speed the processing of files containing student enrollment in the fall. With the June 2, 2010 release of the Common Core Standards by the National Governors Association and the Council of Chief State School Officers, a new set of opportunities has been presented to educators to establish more rigorous and beneficial academic expectations for students and schools. The development of these standards has already influenced the standards revision process in many states. Those states currently in the process of revising and updating their local standards will now have an opportunity to consider how the Common Core Standards will inform their new educational objectives, whether through direct adoption or mapping of common goals, as part of a collective effort to raise student achievement across the nation. Assessment Technology, Inc. is eagerly anticipating the opportunity to assist districts using Galileo K-12 Online in the transition to new state standards and in aligning their standards with the Core Curriculum Standards. ATI’s existing process of specification to develop precise assessment and instructional content is the key factor in the process to manage this transition. As we develop materials and questions to instruct and measure student success on the state standards we write specifications that not only accurately and effectively measure the standard, but further refine the process by defining the particular skills or knowledge inherent in components of that standard. This fundamental, systemic approach places the full content of the Galileo K-12 Online banks in a format that allows for detailed and precise mapping, or in this case remapping, of assessment items and instructional materials to particular characteristics of state standards. The diversity of our 74,000+ item bank and 1,500+ Instructional Dialogs draws on our experience writing to measure the standards present in each state and then finding the exact mapping appropriate to those items in other states where that same skill or knowledge is demanded. Rather than applying generic items at the most broad levels, we have defined the specifications to allow lessons, activities, and items to be used exactly where they are needed. This expertise will be a tremendous asset as ATI works with our partner-districts in the transition from the generation of standards we have all been using over the last five to eight years, to the new state or Common Core Standards as they are adopted by the states. Such systems promote collaborative problem-solving and action planning; they may also integrate instructional data with student-level data such as attendance, discipline, grades, credit accumulation, and student survey results to provide early warning indicators of a student’s risk of educational failure (p.9). The Race to the Top initiative provides a unique, exciting, and timely opportunity for school districts to achieve the goal of elevating student achievement beyond current levels, and to do so in ways that enhance our competitiveness in the global society. Among the many elements that will contribute to success in achieving this goal is the well-informed selection, implementation and management of a high quality local instructional improvement system. In a nutshell, the opportunity to change achievement by the end of each school year is within our reach when we are empowered with actionable information on student learning that helps us to adjust instruction throughout the year. Learning occurs on a daily basis, thus, it is reasonable to assume that the goal of increasing learning can and should be supported one day at a time. A well-designed, research-based, standards aligned instructional improvement system can help to address this need. •Consider the various management procedures and technology for addressing challenges that may be encountered in implementing programs designed to elevate achievement. •An effective instructional improvement system begins with the specification of goals to be achieved within a specified time period. What challenges make it difficult to specify essential standards to be targeted for instruction within a given time period? How can those challenges be addressed effectively? •An effective instructional improvement system uses formative assessments and a common set of interim assessments within each grade and subject. What challenges make it difficult to adopt common interim assessments and how can those challenges be addressed? •In an effective instructional improvement system, instruction is adjusted following each interim assessment by implementing re-teaching and enrichment interventions. What challenges make it difficult to implement re-teaching and enrichment? How can those challenges be effectively addressed? •Implementing an instructional improvement system requires groups of administrators and teachers to work together to provide an assessment system that can be used to inform instruction for all students. What are some of the management challenges associated with designing, scheduling, and implementing customized formative and interim benchmark assessments? What are the challenges associated with designing and implementing curricular interventions based on information about student learning? How can these challenges be met? •Re-teaching and enrichment interventions require unanticipated allocations of time and resources to the instructional process. How do you meet the challenges of allocating time and resources to re-teaching and enrichment? If you would like information regarding how panel members responded to these and other questions that emerged during the seminar, please contact us at ATI and/or watch the seminar video to be posted soon on the ATI website. If you would like to share your comments on these challenges within the forum community, please do so here. And, if you have questions that you would like to pose related to instructional improvement systems and the Race to the Top initiative, please post them here for comment from ATI and the forum community. Item Response Theory (IRT) item parameter estimates play an important role in many of the reports generated in Galileo K-12 Online. In addition to describing item characteristics in the Item Parameter report, they help to determine student Development Level (DL) scores and to identify the standards that are recommended for re-teaching efforts in the drill-downs from the Risk Assessment report. But what are they? 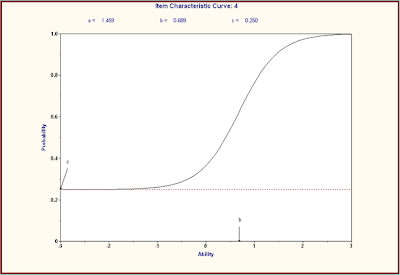 The best way to understand what item parameters refer to is to look at an Item Characteristic Curve. 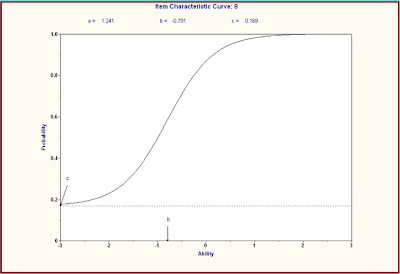 On an item characteristic curve, which presents the data for one, specific item, student ability (based on their performance on the assessment as a whole) is plotted on the horizontal axis, with a mean of 0 and a standard deviation of 1. The probability of answering the item correctly is plotted on the vertical axis. Typically the probability of answering correctly is relatively low for low ability students and relatively high for students of higher ability. The first example (Item #4) is an example of a great item as far as the parameters go. The b-value (difficulty) for that item was 0.689, which is a bit on the difficult side, but not too bad. The important point here is that b-values (item difficulty) are on the same scale as student ability. So what this example is telling us is that students at or above 0.689 standard deviations above the mean are likely to get the answer correct. Students below that point on the ability scale are more likely to answer incorrectly. The b-parameter is also known as the location parameter, because it locates the point on the ability scale where students start demonstrating mastery of the concept. The a-value (discrimination) refers to how well the item discriminates between different ability levels. 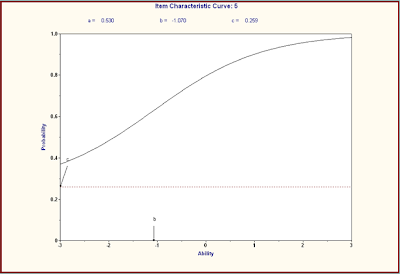 It’s how steep the rise is in the curve that shows the probability of answering correctly. Ideally, there is a nice, steep rise in the probability of answering correctly like the one for question 4. That indicates that there is a dramatic change in how likely it is that a student has mastered the concept that’s pin-pointed within a very narrow range of the ability scale. You can be pretty confident that students above 0.689 standard deviations above the mean “get it” and that students below that point generally don’t. The discrimination parameter for question 4 is 1.459. The next example, Item 5, shows an item that doesn’t discriminate quite as well as Item 4. The a-value on that one is 0.53. It’s also a pretty easy item, with a b-value of -1.07. So, on this one, most students are likely to get it correct, unless they’re more than one standard deviation below the mean of the ability scale. It’s not necessarily the case that an easy item automatically has poor discrimination. The final example, Item 8, is an easy item that discriminates very well. Although students at most ability levels are likely to select the correct answer, there is still a dramatic increase in likelihood of answering correctly within a relatively narrow range of the ability scale. The guessing parameter (the c-value) is the probability of getting the item correct by just guessing. It defines the lower limit of the item characteristic curve. For a multiple choice item with four answer choices, the guessing parameter should be around 0.25 or, preferably, a bit lower.